Prom. Wedding. Homecoming. Military ball. While fun for most once at the event, the sometimes overwhelming stress beforehand all boils down to the dress. Yes, the (dreaded) dress! You can't wear the same one twice. Perhaps the one from last year's ball doesn't fit anymore since having your bundle of joy. Or maybe this is your first ball and you need a gown. Meet Nicole Tunkara of NT Bridal Design and Alterations. She is your local seamstress who does a little bit of everything. Sewing for 25 years, Tunkara has found that she sees each new dress or project as a puzzle. Her trained eyes and experience allow her to arrange the pieces in such a way that her client's best features show and the self-esteem (for some clients) comes shining through. Tunkara stated, "we've been taught we have to be uncomfortable to be fashionable." She creates clothing that fits the person instead of attempting to fit the clothing to the person. Her desire is to help each of her clients feel their best with clothes that are comfortable and tailored to their own body. 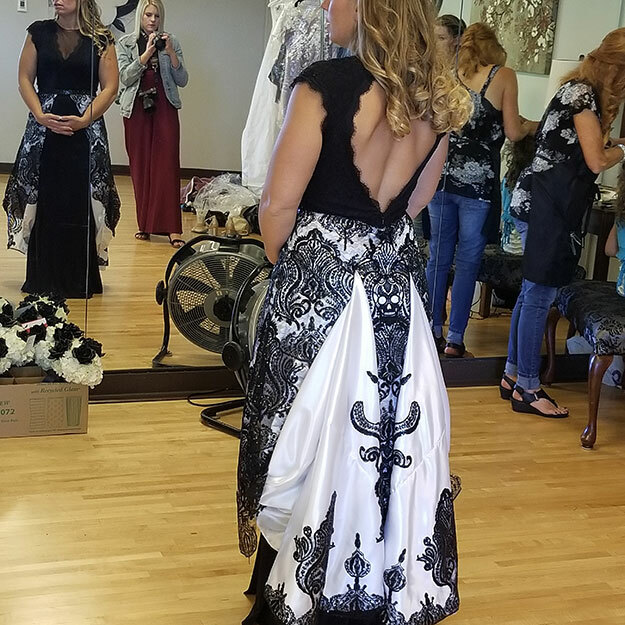 In addition to ball gowns and wedding dresses, she has made gowns for pageants, religious occasions, and other special events. One of her clients is the reigning Miss Washington. Tunkara can change the size of an item (up or down) or revamp it. Many times, she designs without a pattern. She works with beads, satins, sheer and lace. She can work with leather such as repairing motorcycle chaps and leather jackets. She can sew patches on uniforms. For example, she designed a christening gown from the mother's wedding gown. Since she had an entire wedding gown of fabric to use, she did not have to purchase additional fabric. She even used the zipper from the mother's dress. Tunkara alters, repairs and sews almost anything. "If a piece of clothing is good quality, it's worth repairing it instead of putting it in the landfill." She can repair your favorite handbag or replace the zipper in that little black dress. Tunkara takes "Reduce, Reuse, Recycle" to a whole new level. She has created camping accessories including hanging shoe bag-style panels to hang in the tent or R.V. to hold odds and ends like toothbrushes, cell phones, and other small items. Tunkara has fashioned tote bags, trunk organizers, and handbags. She has made Christmas stockings, throw pillows, as well as curtains. While most of her clientele are female, Tunkara does work with men who need suit pants hemmed, a jacket repaired, or to create something that a local store or website does not offer. When asked why she does what she does, Tunkara's eyes light up as she says, "it's all about the twirl they do in my living room."